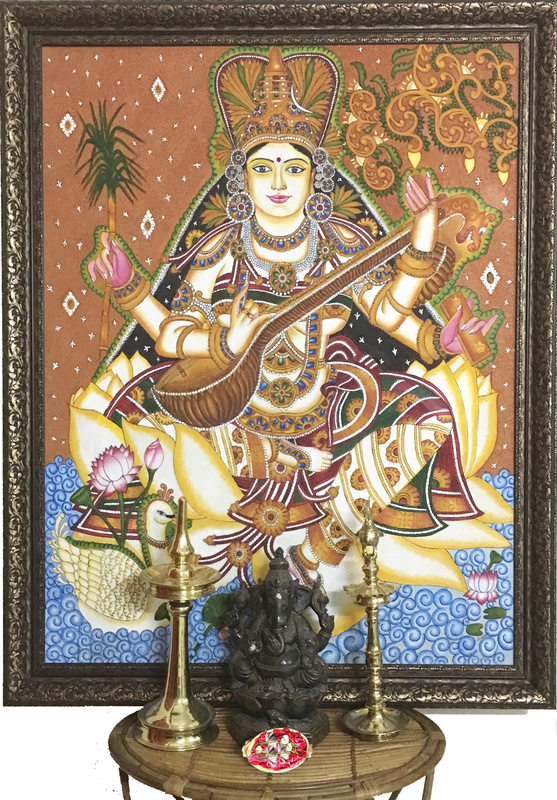 After Visiting Kanchipuram Temple during January this year, I was completely hypnotized seeing Goddess Kamakshi dressed up as Goddess Saraswathi with a Veena on her hand. It was as though SHE was sitting there live playing the Divine Instrument with a very beautiful smile on her face..Was not feeling like coming back home..All the way back home, I was telling my life partner that when am I going to see her again..She looks so divine…I realised that there was a wave of absolute surrender at HER feet with Intense Devotion..Suddenly I felt somehow there was a supreme attachment to Goddess Kamakshi after seeing HER almost 30 years after ..I was in a Trance !! Next day morning, when somebody rang the door bell and as I rushed to open the door expecting the man who delivers the milk, I was completely surprised and taken aback when I saw one of my my students with a very big portrait (as big as 6 feet) of Goddess Kamakshi, exactly as I saw HER in Kanchipuram right in front of me !!! It was as if SHE was just behind me on the way back home.. I had given it for framing and it was endless waiting till today. But SHE had chosen this day, TODAY – Friday – 20th April 2018, Sankara Jayanthi – to come to our home. SHE does not fit inside the Pooja Room wall.. She prefers to sit in my Music Hall, the only place, where I could place HER, other than my HEART !!.. Sharing the Divine portrait with all my friends here.. Feeling Immensely Blessed ..
Pranams to the Deity and the blessed! Really blessed to read this post Madam. Sukla Paksha Panchami is for Ambal. So blessed you’re to receive Ambal on the auspicious Sankara Jayanthi dhinam. Mahaperiyava Sharanam!!! you are truly blessed Ma’am ! If possible , could you kindly give the sanskrit original sloka for “I prostrate to the dawn/dusk lamp” tanslation on your blog at the top, please? Thank you.